Posted on Fri, Jan 20, 2012 : 12:08 p.m.
Denis Matsuev plays a solo recital at Hill Auditorium on Monday. When the Mariinsky Orchestra appeared at Hill Auditorium last season, under University Musical Society auspices, it was clear the audience was in for an evening of spectacular music: the Rachmaninoff Piano Concerto No. 3, followed by Mahler’s Symphony No. 5. The music did not disappoint. 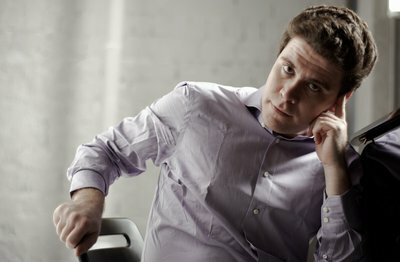 And neither did the soloist—Russian pianist Denis Matsuev, then 35, making his Ann Arbor debut. His playing in the Rachmaninoff was nothing short of jaw-dropping. We can close our mouths now: Matsuev coming back, and not just for an orchestral cameo, however boldly carved. What: Solo recital of Schubert, Beethoven, Grieg and Stravinsky. How much: $10-$56. Tickets available from the UMS Ticket Office in the Michigan League, 734-764-2538, and online at ums.org. When Matsuev returns to Hill Auditorium Monday evening, it is for a solo recital (postponed from the UMS fall calendar). His program is a tour of great 19th century sonatas - the Schubert Sonata in a minor, D. 784 (1823); the Beethoven “Appassionata” Sonata, Op. 57, in f minor (1804); and the Grieg Sonata (1865). For the program’s capstone, Matsuev turns to Russia and 20th century master Igor Stravinsky, represented here by the knuckle-busting “Three Movements from Petrouchka” (1921). Stravinsky arranged this music, taken from his ballet “Petrouchka,” for the famous Russian pianist Arthur Rubinstein. He wanted to tempt Rubinstein (and other pianists) into playing his work; the results are as dazzling as they are daunting: the technical and musical challenges are immense. No question that Matsuev will be up to them. When he appeared with the Mariinsky in the Rach 3, he was a veritable force field at the piano, whether in passages of hushed lyricism or finger-blurring bravura. How he deploys his titanic pianistic technique and his musical sensibilities in works from Schubert through Stravinsky should make for an exceptional encounter.